Italy and its food is something that Tony treasures. His recipes are filled with passion and a love of food. 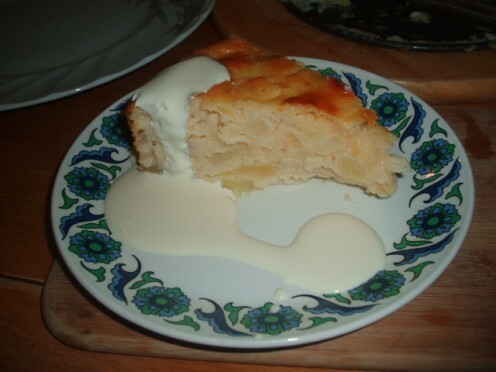 Today I have for you a sweet surprise, in fact I have two, the first is an Italian favourite called torta di mele the second is a French apple tart both of them I flavoured with Calvados apple liqueur. My friend Fabio comes round most weeks and we share our recipes, his family originate in Tuscany whilst mine are all Yorkshire people. This means that we get a great variety of recipes and we both use our grandmother’s recipe books for inspiration. 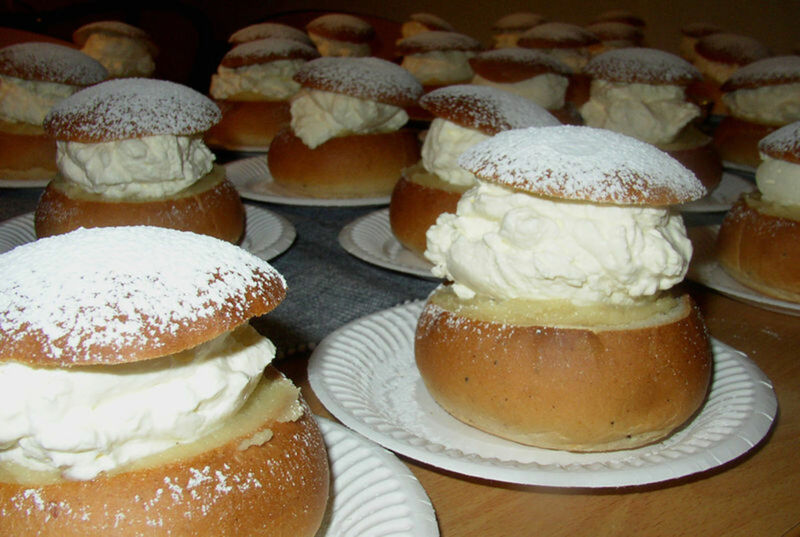 I’m not a great one for making sweet dishes, but most of my family enjoy sweets, and it is fair to say that my wife enjoys the puddings and the sweets more than the main dish itself. 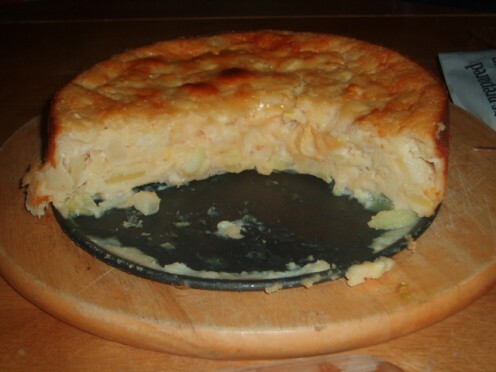 So first, let’s start with my old friend Fabio’s dish which he calls torta di mele. When we have these cook nights we chat about all kinds of things, but mostly our childhoods and the difference between being raised in England and Italy; I think they have more sense of family than we do. One lemon use both the zest and the juice. Six eating apples. Something like Cox’s pippin, or even the aromatic pink lady. 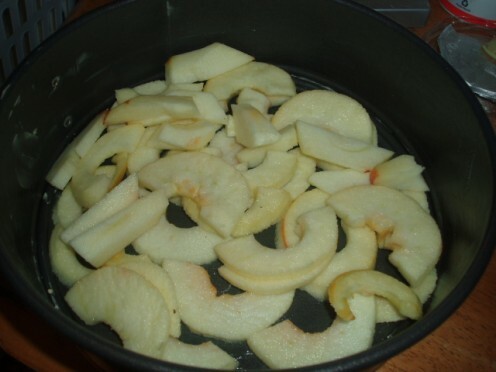 Peal the apples and submerge in a mix of lemon juice and water, this will prevent them turning brown. Cube and core 4 apples and then core and slice the other apples. The mix is easy, In a large bowl mix together the yoghurt, flour, sugar, eggs, oil, grated lemon zest, yeast and your chopped apples. Give them a good stir to make sure the apples are fully mixed in. 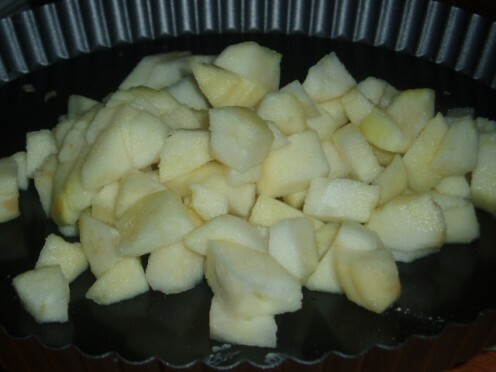 Grease and flour a cake tin and put the remaining sliced apples in the bottom, placing them in decreasing circles. Sprinkle them with calvados and caster sugar. Pour the mixture on top and put in to a preheated oven at 180°C for thirty minutes or until it looks set. 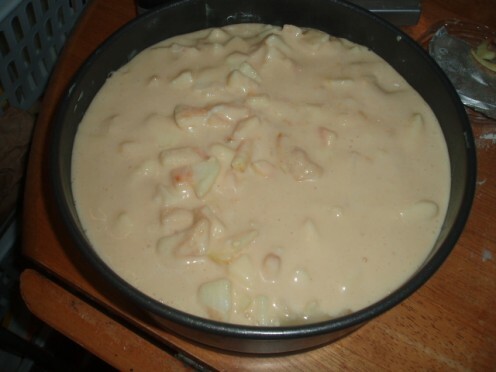 Fabio said his grandmother would make four of these to accompany Sunday lunch when the local apples were just ready to pick, and not a morsel would be left by the end of the day. Dust the surface with icing sugar before serving. 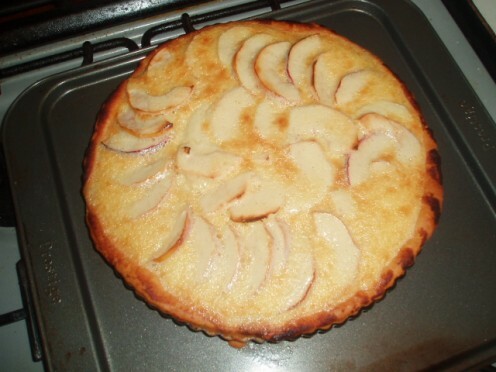 This tart is delicious just warm, but you can also be eat it hot with vanilla ice cream, or cold with hot custard. We had some delicious fresh cream to top ours; I wonder what you will choose? Next time it will be with vanilla ice cream, not because it is better, but I just want an excuse to cook another of these tarts. 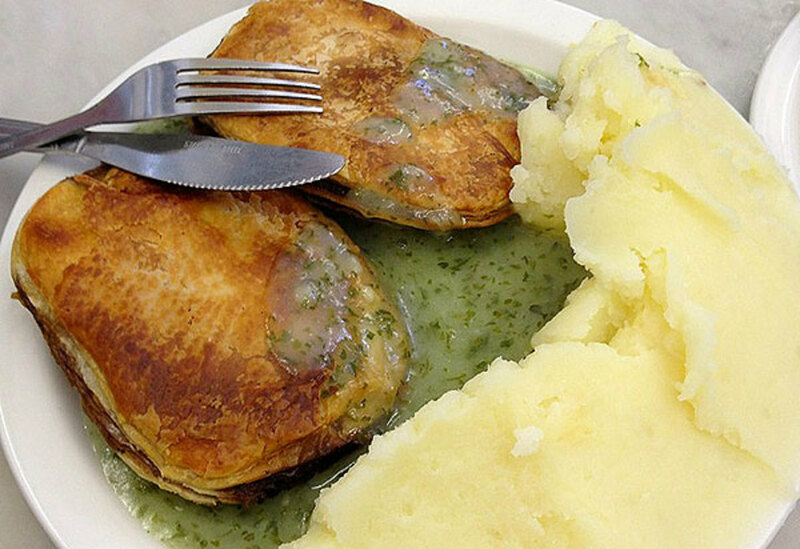 I promised you two puddings, being a man of my word [obviously not a politician] I offer you this as a second helping. Calvados, is a French brandy, and is derived from, apples. But beware: overindulge in this fruit-flavored spirit and you may be in for a whopping headache and hangover. 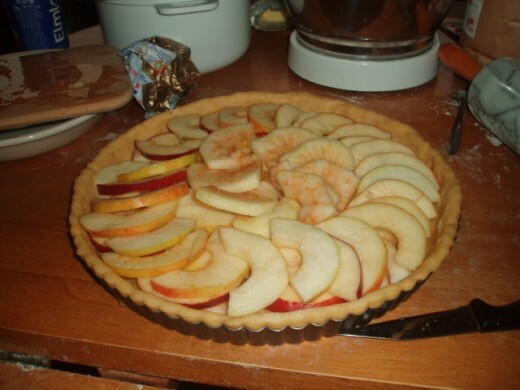 So, when Fabio and I had finished making the Italian apple tart it was obvious we could use up some of the spare apples we had with another dish. When I worked a summer in Normandy France, I tried an apple brandy named after the adjacent province called Calvados. A beautiful region, which incorporates some of the Channel Islands, anyway they are well renowned for this brandy. However, beware it is a little like scrumpy made from apples it has a kick like a mule. I learned this recipe there and I have made a couple of little changes but I’m sure you will like them. 250gm plain flour, 125gm of unsalted butter, a pinch of salt, an egg and enough water to make a dough. Knead it all together on an oiled board until it forms a nice dough. [I use an oiled board rather than sprinkling with flour to stop the dough tightening up with the extra flour. Flatten out the dough and put it in the fridge for thirty minutes or so. 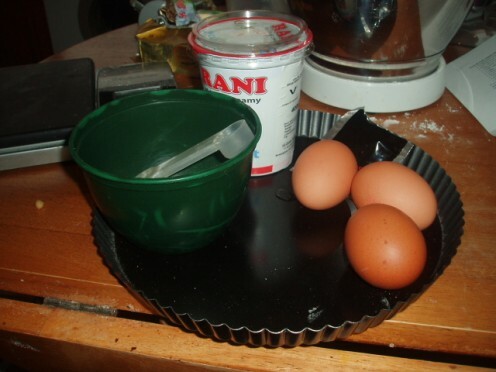 You need a flan dish, I use the ones with the removable bottom, easier and less prone to accidents than a solid dish. Grease it with a little butter and then put aside ready for the dough. 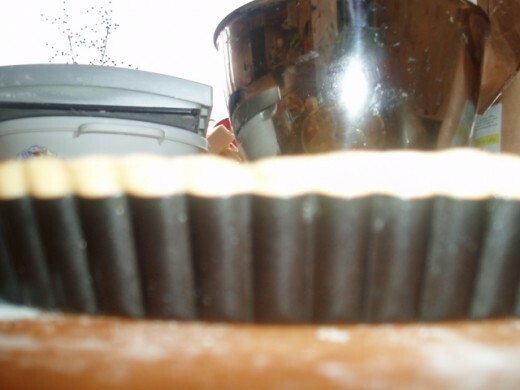 Roll out your dough until about 2mm thick and carefully lay it over your tin, make sure that you exclude any air from beneath it and that you fit it snugly into the tin. Now pinch the dough so that it stands proud of the tin by about 2-3mm, this gives you a little more depth to the pastry and helps it cook. Place it into the fridge until your filling is ready. Fabio is a better pastry cook than me; I think it is because my hands are too warm; you need cool hands for pastry. I usually rinse them with cold water before I start. 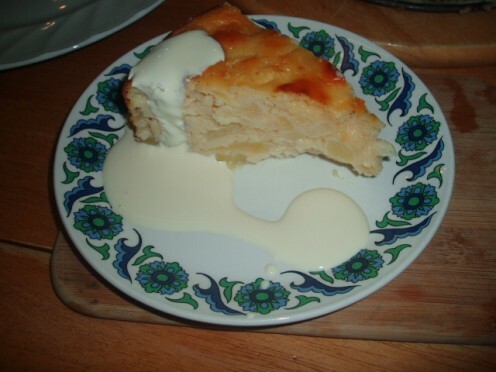 Another friend of mine was recently at her cottage in France and she brought me back some Calvados just for this recipe. Don’t worry if you don’t have any just use ordinary brandy instead. In a saucepan, you need to melt about 15g of butter and add to it a squeeze of lemon juice, 25g caster sugar and the real kicker 1tbsp of the brandy. Stir until you have a smooth mix. Turn off the heat. In a bowl mix; 1 egg, 100ml of double cream, and 30g of caster sugar. 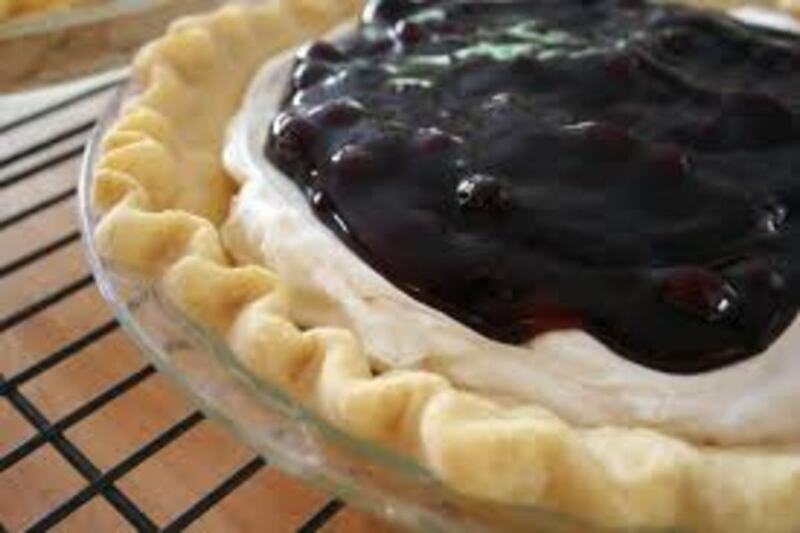 Remove the pastry from the fridge ready to assemble your tart. 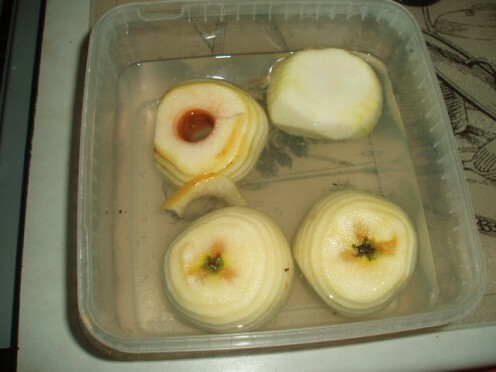 Peel and core 4 apples and place in water with a little lemon juice to prevent them discolouring while you work. Cut them into segments and arrange them in circles. Then sprinkle with a little sugar and pour your cream mix over the top. Bake in the oven for ten minutes at 220C gm7 and then reduce the heat slightly to 200C gm6 for about twenty minutes or until the pastry looks cooked. 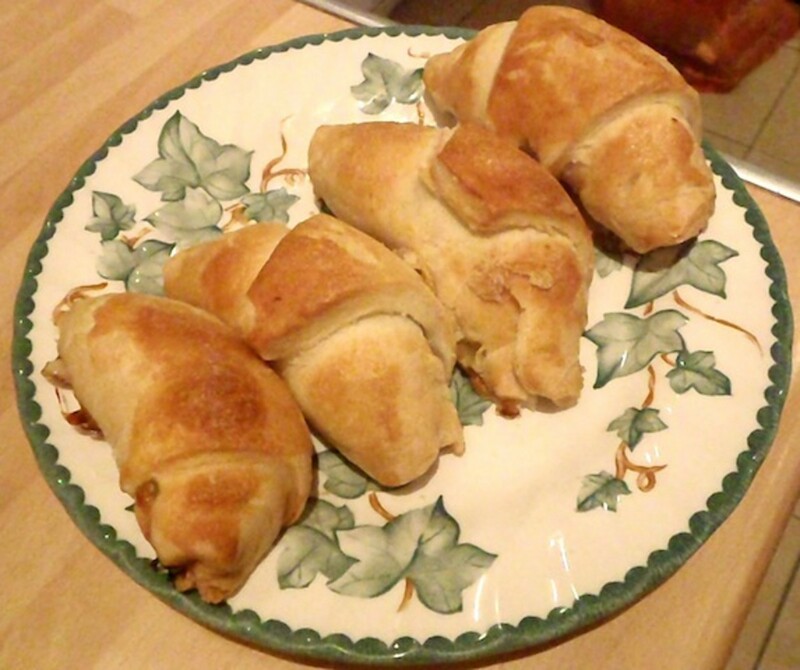 I really do hope that you will try these two recipes and let me know what you thought of them. Please leave a comment and tell me if you like my style of writing and my recipes. I agree with you that they are more interested in other worlds. For me it was a wonderful part of my job as a travlling musician to meet so many people from so many walks of life and countries. Kiplin, if I had to choose just one. The humour and depth of his writing to me is awe inspiring. Because I love India so much and watch TV or anything if it about that country then I suppose it has to be he that gets my vote. DIckens is very close behind, because I and I suppose everyone else loves his rather eccentric characters, even if they don't read his works. Tony, Yes, it's from a combination of studies and just a few Mongolian/Tibetan acquaintances as well as my sister Stessily's emphasis on South Asia in graduate school. It's from the USA, and back again, that I traveled to southern France for University studies. It's impressive how non-English-speaking cultures make such a point of becoming acquainted with the rest of the world. In general, I've found people abroad enthusiastic and informed about both classic and modern art, literature and music. Who's your favorite author in the English language? That is most interesting. When I was in Russia my friends there amazed me with how they knew so many authors and writers from not just their homeland, but from the rest of Europe too. I feel I am pretty well read amongst my peers here, but against them I felt to be straight out of a cave. I know the most popular of European writers, but that's all, Dumas, Hugo, Sartre maybe a few others, but you must have come across them all. How I envy you that experience. So your interest and knowledge of Ghengis Khan is from your studies too perhaps? By the way the monument to him in your article is incredible. Did you live in the States when you were studying in France? Tony, It's Romance languages and literatures plus Middle Eastern/Asian history that I studied in southern France. Wow that's impressive, what were you studying? How long ago was that? Tony, Holidaying has been a reason for being in France. But my most extended interaction with la belle France was as a student at a French university. The Italian version is so simple to make, because there is no pastry to worry about. It keeps well too, which is a bonus. vanilla ice cream goes with everything in my book, especially dark sherry, amereto, and apple schnaps. many thanks for you super-duper, flawless, superlative comments. Seriously thank you for sharing your thoughts and insights, I'm pleased to bring back happy memories for you. Were you holidaying in France or working? your turn to answer questions. Tony, What appetite-stimulating, belly-rumbling, finger-licking delectable recipes you offer readers today! In particular, both recipes represent trips down memory lane for me from my years in France and Italy. 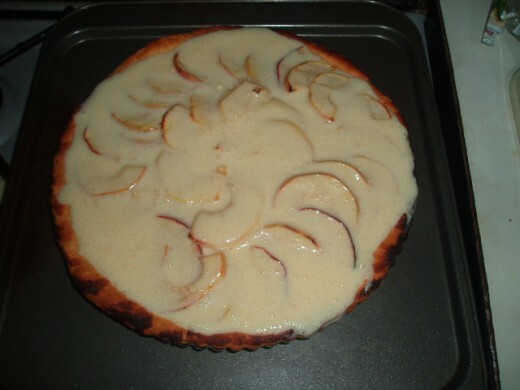 Both tarts look -- and undoubtedly smell and taste -- every bit as awesome as I remember. It might be hot with cold vanilla ice cream for me. But I'm more than willing to try your creamed version. 35 degrees F is what it's hitting at night here --- a bit cool indeed. Heh heh, I know how some people can be! Looking forward to the calvados chicken hub. I've made the chicken with calvados and now you must wait a few days for the recipe, but let me tell you it is worth the wait. we cheated, because we used the indoor ovens and not out in the garden where I usually cook with the big cook pot/oven. At the moment it is 35 degrees F outside and my scouting for boys days are over. Fabbio only adds the glamour, I'm really the brains here, don't let him know I said that though, he's very sensative; you know what some people can be like. kind regards back to you too Stessily. Tony, I could taste it, too, during my comments, and your concurrence wafts a magnificent aroma my way. Please do follow through! And please write about it and include photos! :-) The tantalizing aromas of Calvados chicken in a dutch oven and of Calvados pork are beguiling me! Thank you for sharing your culinary skills, as well as those of Fabbio! I'm delighted that you liked the recipe and left me such a great set of comments, it makes it all worthwhile as I'm sure you know. I like the idea of calvados with stews, in fact you've give me an idea; Fabbio and I are making a chicken dish this week in my dutch oven and it would be maybe an interesting addition to that. It should be good with pork too, because they were reared to use apple sauce and sage on. I'm off to take a look at that, yes I can almost taste it now. 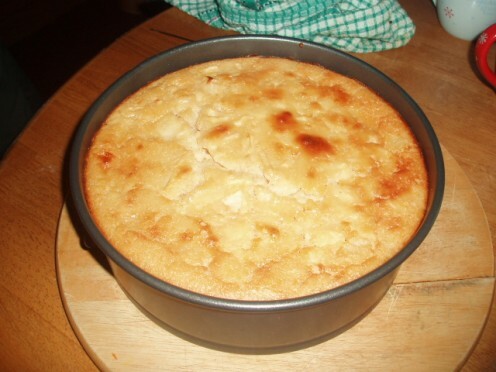 Tony, the torte di mele recipe was well worth waiting for --- your description and images give such a sense of its presence! Calvados does indeed pack a powerful punch for the unwary. 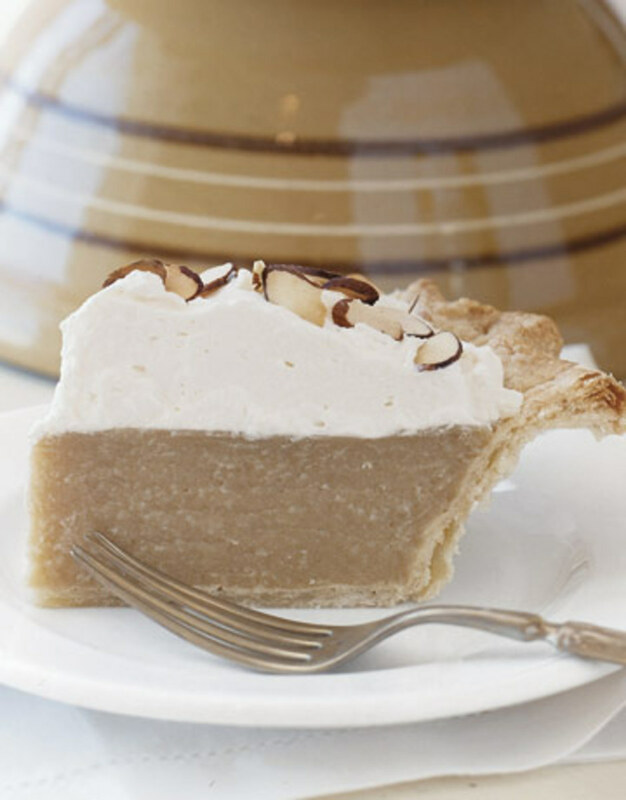 It wonderfully enhances cuisine and really enhances desserts, although I've toyed with the idea of sprinkling it into a few stews or on other main dishes! I look forward to the days when I may cook to my heart's content in my kitchen, hopefully soon. These two recipes will be made on the same day for they both appeal to me! Thank you for notifying me of the final (!) release of this treasured torte di mele and the surprise inclusion of the French version. Your camaraderie with Fabio is endearing; I hope that you share more of your cooking creations. Your families are very fortunate indeed that you and Fabio are enthusiastic, talented chefs!